North Korea's markets appear to be coming to life again after a botched currency reform late last year laid waste to them. Footage obtained by the Chosun Ilbo's Northeast Asia Research Institute from a North Korean source on Wednesday shows the Chaeha market in the border town of Sinuiju early this month bustling with trade. "The sprawling Chaeha market was set up in 2003 and is located in a wealthy neighborhood along the trade route with China," the source said. Images taken in March of a market in Onsong released by the Chosun Ilbo in April showed most of the stalls empty, but the market in Sinuiju is now overflowing with sundries, clothes, hardware, fruits and food. 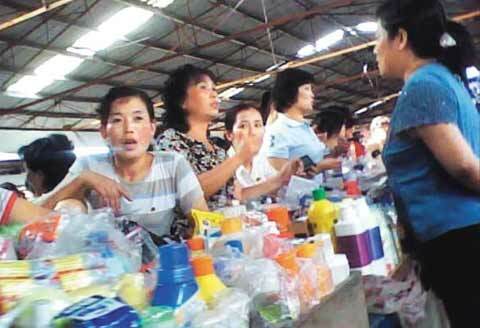 The Chaeha Market in Sinuiju is packed with vendors and customers in this screen grab from a video obtained Wednesday by the Chosun Ilbo from a North Korean source. The market is bustling with traders and customers. North Korean security agents used to patrol the markets before the currency reform, but none are to be seen in the video. The only semblance of state control is an official wearing an armband that reads "administrator" walking quietly past the vendors. According to sources in North Korea, markets in the country were practically deserted until May, but the situation began to change in June. Now business is booming. Sources say the authorities have virtually stopped trying to control the markets after former premier Kim Yong-il apologized for the failed currency reform and Park Nam-gi, the former director of the North Korean Workers Party's Planning and Finance Department, was executed. North Koreans apparently protested vehemently when the government failed to provide food following the currency debacle and demanded they be allowed to buy and sell goods in the markets. These days, the traders apparently hurl abuse at any security agents attempting to crack down. A South Korean intelligence source said, "It looks like North Korean authorities have given up their fight against the markets again." Chinese products stacked on the shelves range from plastic basins, porcelain dishes and thermos bottles to cosmetics, electric fans, rice cookers and even motorcycle helmets. But the scene is quite different behind the stalls. The source who provided the footage said, "Vendors openly sell Chinese products, but they sell South Korean goods under the table." "Cuckoo rice cookers, Samsung Anycall mobile phones and LG TV sets are very popular," the source said. "South Korean clothes are brought in with their labels removed, but wealthier people prefer South Korean clothes over Chinese ones." The source said a large market which sells only South Korean products has also formed in the Chinese city of Dandong just across the Apnok (or Yalu) River. The situation is apparently the same in other North Korean markets. 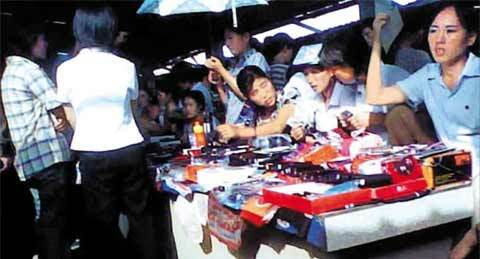 One North Korean defector who used to sell goods at an open-air market in North Hamgyong Province, said, "We display Chinese cosmetics but tell customers we also have South Korean ones. When a customer wants South Korean cosmetics, we take them out from under the table and sell them in the backroom." 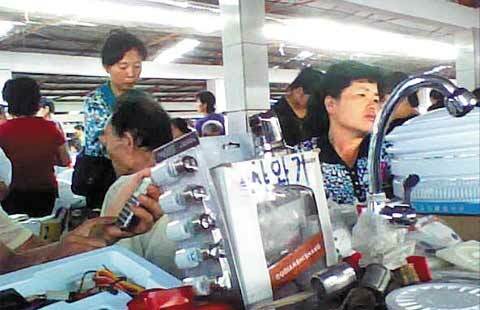 The traders sell South Korean products because they fetch a handsome profit. "Chinese products usually have a set price tag and consumers try to haggle, but South Korean products go for a premium and there's no haggling over prices, because they are considered top-notch products," the source said. South Korean DVDs and music CDs are also in high demand. North Korean movies and CDs, are on display, but the latest South Korean soap operas and American action movies are freely available under the table, according to the defector.